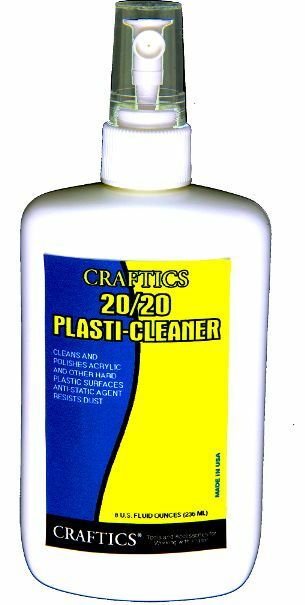 Craftics 20/20 Plasti-Cleaner 8oz pump bottle. Cleans and brightens acrylics and other hard plastic surfaces in one fast operation-without scratching or filming-and leaves a streak-free, high-shine finish. Its anti-static properties also resist dust and fingerprints.Use with our disposable or re-usable cleaning cloths. 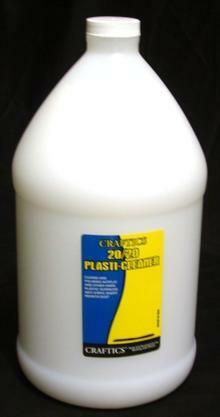 Craftics 20/20 Plasti-Cleaner-5 gallon jug. Cleans and brightens acrylics and other hard plastic surfaces in one fast operation-without scratching or filming-and leaves a streak-free, high-shine finish. Its anti-static properties also resist dust and fingerprints.Use with our disposable or re-usable cleaning cloths. **UPS Special handling and/or oversized fees WILL apply on this item. 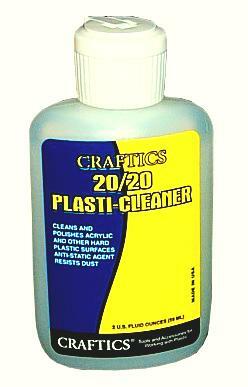 Craftics 20/20 Plasti-Cleaner-2oz flip-top bottle. Cleans and brightens acrylics and other hard plastic surfaces in one fast operation-without scratching or filming-and leaves a streak-free, high-shine finish. Its anti-static properties also resist dust and fingerprints. 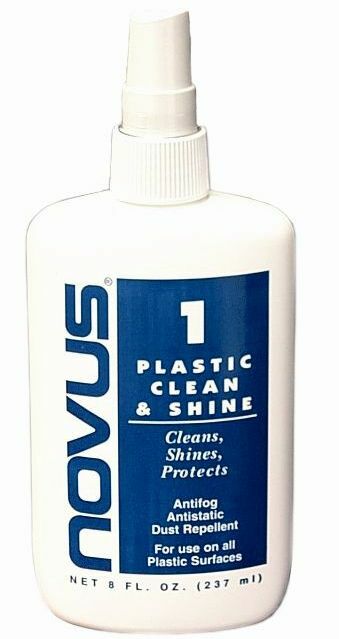 Novus #1 Plastic Clean & Shine-8oz pump Gently cleans without scratching and leaves a smooth finish that resists finger marks and fogging. Silicone based formula.